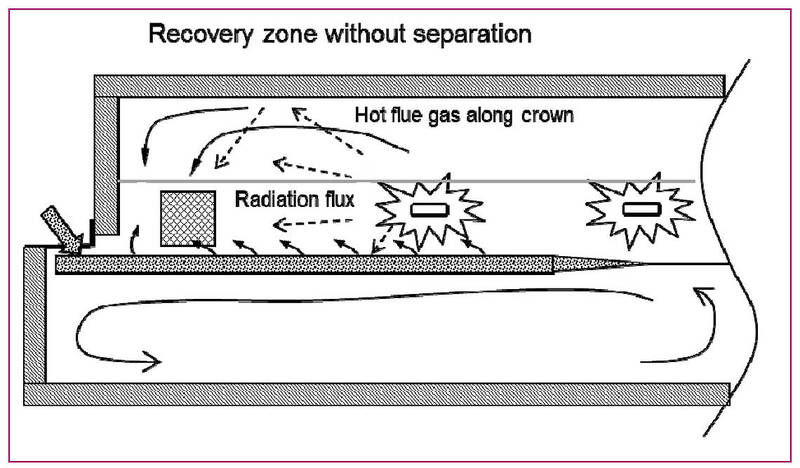 The flue gas in oxy-combustion tanks is usually evacuated by openings in the breast walls of the furnace. These flue gas outlets are placed in the batch area in order to reduce the temperature of the flue gas leaving the tank. However, this design is not very efficient as it allows a significant, uncontrolled recirculation of flue gas between the hot, (central) zone and the colder zone above the batch blanket. Furthermore, the semi-transparence of the flue gas allows an intense radiative exchange between flue gas, walls and batch surface thus leveling out the desired temperature drop of the flue gas towards the outlets. The new proprietary design of Fives, H.R.A. 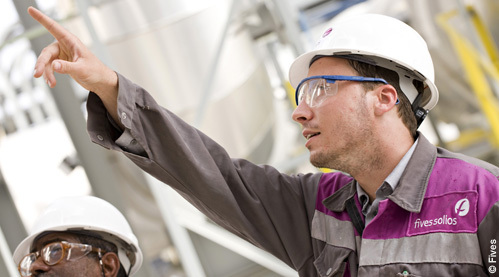 Technology, solves this problem by a controlled, even flow of the flue gas in counter-direction to the batch blanket flow. This is obtained by a reduction of the crown height! A high level of the crown and a large flue gas volume were believed to be compulsory for an intense radiative emission towards the batch surface. 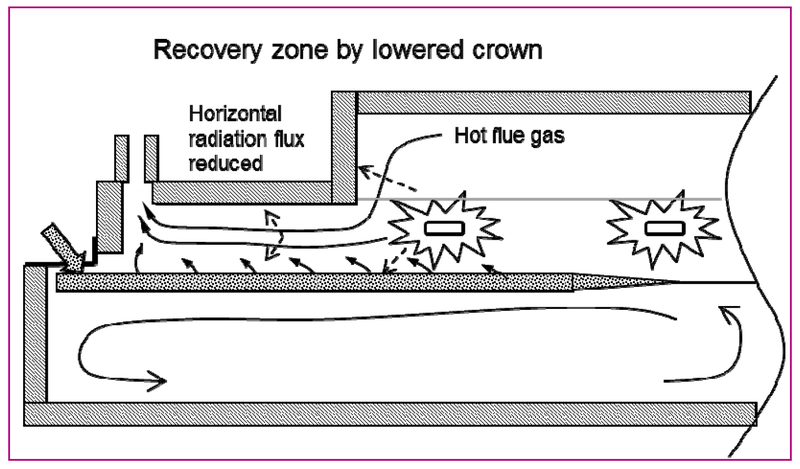 Fives discovered that a much lower crown level optimizes the radiative exchange between flue gas and batch blanket. 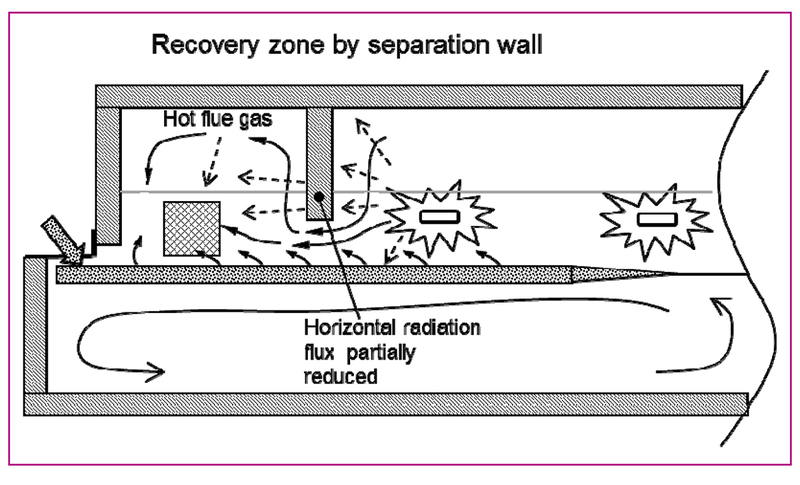 In addition, size and orientation of the flue gas outlet minimize radiative losses by the hot crown and flame radiation. Decrease of the flue gas outlet temperature and energy consumption without the need of an additional tank length compared to the traditional design with breast wall outlets in the batch area. 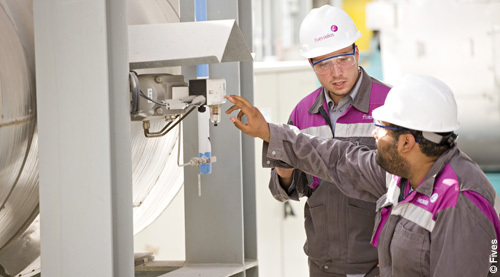 Reduce the energy consumption up to 5-10% compare to conventional oxy-fired furnaces. Have a particular interest for 100% oxy-combustion furnaces – as well as for float glass, container glass or special glass tanks.